Cramped business hotel bathroom is still pretty neat. it was introduced during the 1964 Tokyo Olympics. I suppose I was raised to appreciate bathroom decor to some degree, but there was something gleefully satisfying about just being able to hose down all the walls and see it all go into a big drain in the floor. 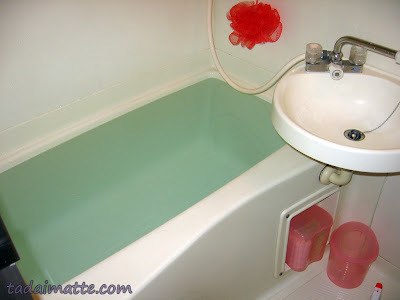 This is a common feature of prefabricated unit baths, which are typical in small apartments, though some unit baths are so small that the washing area is eliminated in favour of a toilet. There are usually no windows in unit baths, either, so the small space makes it wonderfully comfortable for a winter shower or bath. None of the steamy air had anywhere to escape to! I steamed my clothes on a rack above the bath by just turning on the hot water for ten minutes. The idea behind it is to keep the room watertight and thus reduce damaged caused by wet rot, which can be particularly weak in earthquakes. Many Japanese baths are also set up on a heating system called oidaki. In oidaki, one pipe sends water from the tub to the heater and the other sends the heated water back into the tub. It conserves energy and allows the bath to be used by the entire family or even re-heated the following day. This is popular in larger apartments and homes, though less common in the smallest unit baths. If prefab plastic isn't your thing, well, there's always the more traditional type of deep bath found in Japanese houses, usually metal or ceramic, but sometimes made of wood in the style of onsen tubs. And who can turn down cypress (hinoki)? The scent of cypress is so relaxing and nostalgic! I wanted to bring home a cypress bath set (stool, basin, water pail) but they run a little expensive. When I have my own place with a sizable bathroom, I'll kit it all out in cypress. 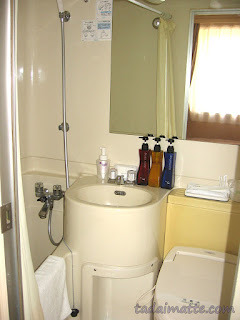 I dearly miss my little bathroom in Japan, and look forward to having a huge deep bathtub again someday.